The sesamoid is a small bone under the ball of the foot. It can become strained in repetitive activities that place pressure on the ball of the foot or involve repeated upward flexion of the big toe. Sesamoiditis is inflammation and pain as a result of this. The diagnosis of sesamoiditis is made based on the location of the pain and on the type of activities that make it worse. There is also pain when pressure is applied to the sesamoid, especially on the inside part of the ball of the foot. Treatment involves primarily rest. Special footwear with a rigid sole that minimizes movement of the joint at the base of the big toe may also be prescribed. In some cases a steroid injection along the sesamoid is given. Pain may increase. 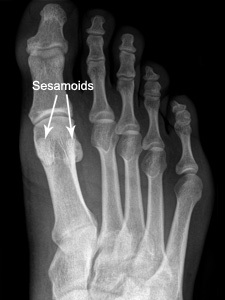 In some cases the sesamoid can become fractured. In severe problems that involve the seasamoid the bone itself can be surgically removed.